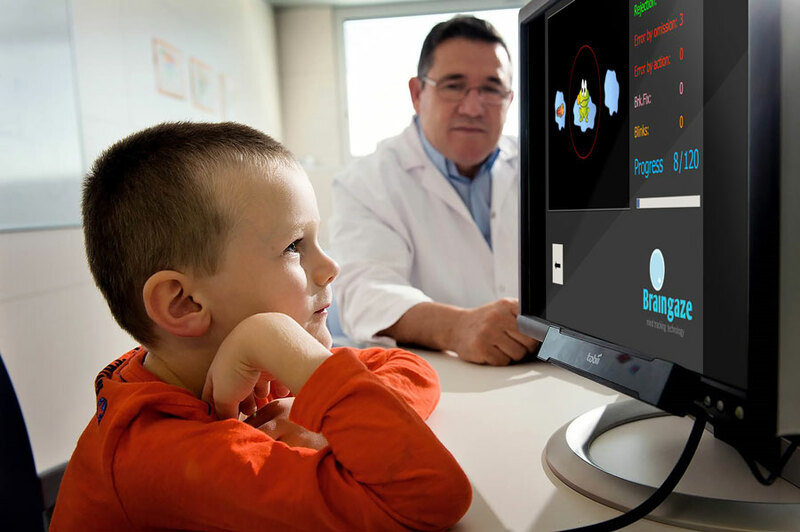 In collaboration with the University of Nottingham, Braingaze started to validate interactive eye tracking video game as an alternative therapy for ADHD. The game called RECOGNeyes has been developed as an intervention for training attention in ADHD people. AHDHD patients who trained their oculomotor system with RECOGNeyes were able to fixate longer on the target that led to an improvement of their behavioral performance in an attention and a reading task. ADHD is characterized by high levels of impulsivity, hyperactivity and inattention. Although there is no cure for ADHD, pharmacologic therapies manage these core symptoms of ADHD. The stimulants are the most common type of medication used for increasing the brain chemical dopamine and norepinephrine, which play essential roles in attention. Other ADHD medications are the non-stimulant drugs and are prescribed when a person has side effects from stimulants, i.e. : sleep disturbance, decreased appetite and weight changes. Around 75% of ADHD children receive pharmacological treatment; but only 58% of these children are good responders (Quintero et al., 2018). Good responders show improvement from baseline. Poor responders, however, suffer a negative impact of the medication on several aspects of their lives. Previous pilot studies have suggested that some serious computer games could be helpful as additional interventions in schizophrenia (Bellack, Dickinson, Morris, & Tenhula, 2005), anxiety disorders (Walshe, Lewis, Kim, O’Sullivan, & Wiederhold, 2003) and attention deficit and hyperactivity disorder (Arns, de Ridder, Strehl, Breteler, & Coenen, 2009). It is important to highlight that the eye movement system is intimately connected to the attention system of the brain. In this sense, individuals with ADHD may have an underdeveloped attention system and therefore poor control of eye movement (Solé Puig et al., 2015). The interactive eye tracking game RECOGNeyes provides an opportunity to train the oculomotor system and thereby improving the attention system. In our study, we used two versions for playing the game. One using the eyes as a controller and one with a mouse to manually control the game. All tasks consisted in trying to catch snowflakes avoiding getting caught by fire. 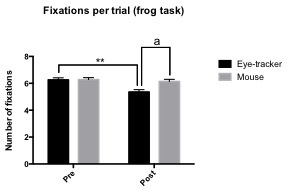 After playing the game for three weeks, ADHD patients were tested with the Happy Frog test (attention) and the Word Recognition test (reading difficulties) of BGaze system. 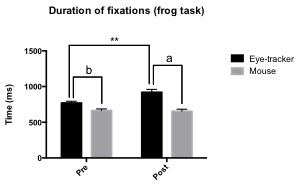 Patients from eye-tracker group were faster in detecting the tadpole/word whereas the participants from mouse group did not show improvement in detection performance (see figure 1). We found that ADHD children that have been playing the eye-tracker version of the game had fewer saccadic movements compared to those who played the mouse-controlled version. The saccadic movements were considered as an impulsivity marker. Furthermore, the number of gaze fixations decreased in the eye-tracker group but not in the mouse group. Similarly, the duration of fixations increased in the eye tracker group but not in the mouse group. Thus, ADHD patients who trained their oculomotor system by controlling the game with their eyes, attention performance is improved. According to our observations of the impulsivity measure and the fixation behavior, RECOGNeyes can be considered as an effective tool to train the oculomotor system. Our results also explain why mouse-controlled video games are not efficient in ADHD treatment (Bikic, Christensen, Leckman, Bilenberg, & Dalsgaard, 2017). These video games do not provide feedback needed to train the oculomotor system promoting the improvement of the attention visual system. Walshe DG, Lewis EJ, Kim SI, O’Sullivan K, Wiederhold BK. Exploring the Use of Computer Games and Virtual Reality in Exposure Therapy for Fear of Driving Following a Motor Vehicle Accident. CyberPsychology Behav [Internet]. 2003 Jun [cited 2018 Aug 26];6(3):329–34. What are the differences between the diagnostic criteria of DSM-5 and ICD-10? An online semi-structured diagnostic interview of ADHD using ACE and ACE+ developed by Prof. Dr. Susan Young.